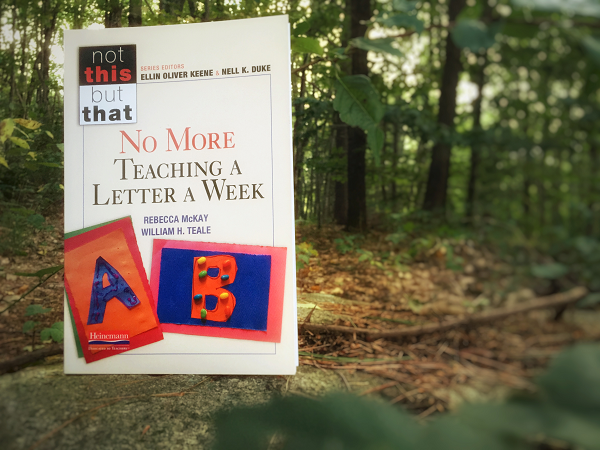 No More Teaching A Letter A Week is the latest offering in the Not This But That series, edited by Ellin Keene and Nell Duke. 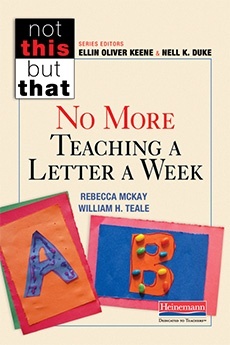 In this new book, early literacy researcher Dr. William Teale argues that alphabet knowledge is more than letter recognition, and he identifies research-based principles of effective alphabet instruction. Literacy coach Rebecca McKay brings those principles to life through purposeful practices that invite children to create an identity through print. 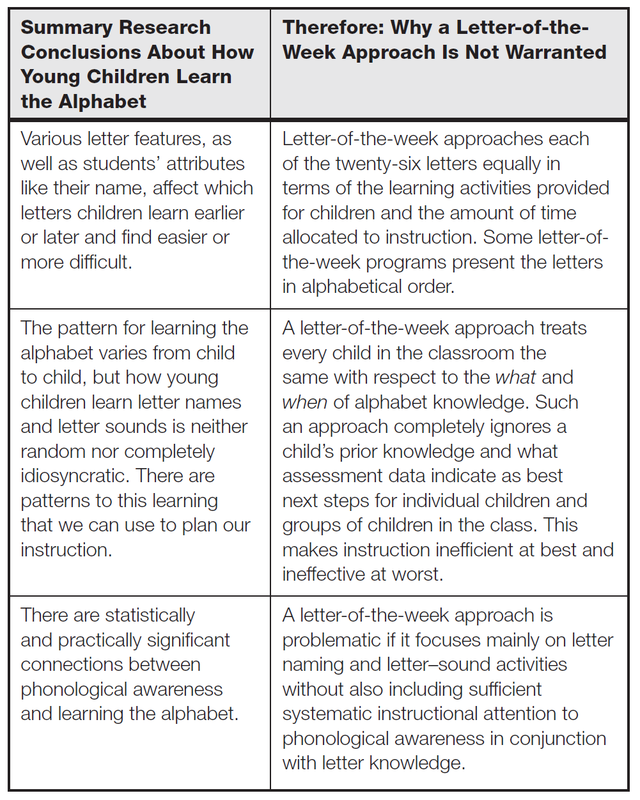 In today's post adapted from the book, William Teale introduces how children learn the alphabet, and how phonics standards differ across the country. Early Reading First Performance Targets—16 to 19 letters. You get the picture—standards for alphabet knowledge vary considerably. What does research say about what standards should be? There is as yet no comprehensive answer to this question, in part because the question itself is multifaceted: Is it how many to be considered not at risk? To be successful in reading at third grade? At first grade? And so forth… It is also the case that few studies have addressed this question directly. The best indicator we have to date comes from research conducted by Piasta, Petscher, and Justice (2012). They investigated the diagnostic efficiency of various upper- and lowercase letter-naming standards for 371 preschoolers, and one particular question in the study attempted to identify “optimal benchmarks.” Findings indicated that an end-of-preschool/beginning of kindergarten benchmark of ten letters was adequate to determine negative predictive power (the vast majority of children reaching this benchmark would not be at risk for low literacy achievement in grade 1), but also that optimal benchmarks were eighteen uppercase letters and fifteen lowercase letters when considering the three later grade literacy outcomes of letter–word identification, spelling, and passage comprehension. Thus, Piasta, Petscher, and Justice (2012) advocate setting higher end-of-preschool benchmarks than those typically appearing in state early learning standards or Head Start standards. 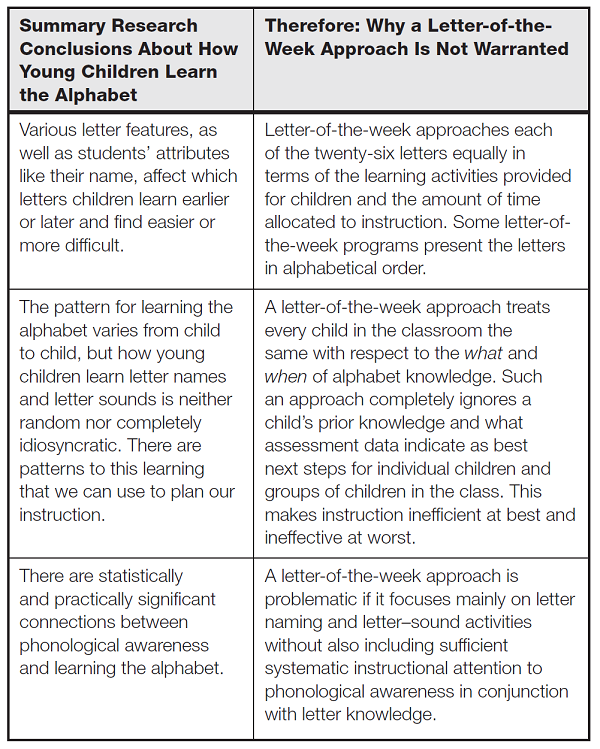 Overall conclusions based on research about how young children learn the alphabet are outlined in the figure below. ​Former Teacher of the Year in Alabama, Rebecca McKay is a literacy coach, a Teacher Consultant for the National Writing Project, a former trainer of trainers for the Alabama Reading Initiative, and a national presenter on a variety of literacy topics.